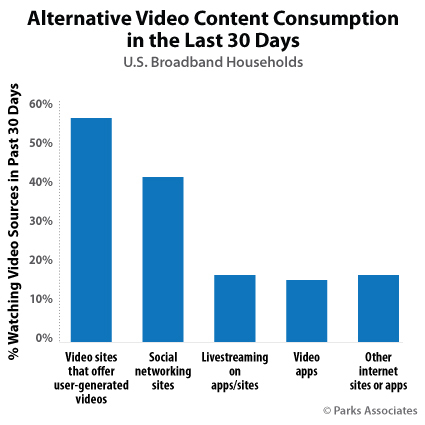 US broadband households watch an average of two hours of “alternative content” on a computer each week from sources including Facebook, YouTube, Vimeo, and Dailymotion, according to Parks Associates. 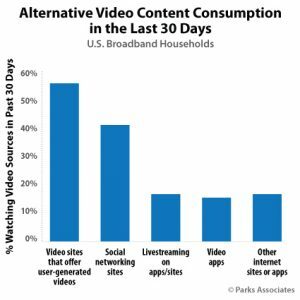 The research firm said that nearly one-half of US broadband homes watch user-generated content on a monthly basis and more than 10% watch livestreamed content – though only 7% of US broadband households watch sporting events via livestream. “Younger consumers are far more likely to create their own content as well as watch user-generated content. For these viewers, the creation of content is as much a part of the entertainment experience as is watching video.